Silver bars have long been the bullion form of choice for physical silver investors. Silver bullion is only designated as bullion due to the 99.9% pure silver content, also known as .999 silver. Most all silver bullion is 99.9% pure silver, except for 100 oz silver bars minted by the Royal Canadian Mint. These bars are .9999 pure silver and referred to as the “four 9’s.” These silver bars command a higher price than other bars. Silver bars are rectangular shaped and range from ¼ inch to ½ inch in height. The mints and refiners that produce these bars melt silver from either ore, scrap jewelry, leftover silver from industries such as the medical field, electronics, and photography supplies. The liquid silver is poured into molds that when cooled, rendering silver bars. These bars are a convenient way to invest in silver. They stack and store in compact places because of their shape and size, and are easily transported. When silver bullion bars are bought from the same mint, they are usually molded to exact sizes and are even more compact when stored together. There are several different standard weights and sizes of silver bullion bars. The most common range is from 1 oz to 100 oz and includes weights of 5 oz, 10 oz, and at times, 50 oz, Silver bars are more economical for investment purposes as silver coins normally have a higher price due to collectability. Silver bars sell for the current precious metal market price at the time of sale, and usually include an additional fee or premium from the dealer. The more desired brands command higher premiums. Smaller sized bars such as 1 oz silver bars carry a higher premium than larger bars mainly due to their convenient size and demand. Smaller bars are also easier liquidated and easier to use as emergency currency. The larger bars such as 100 oz bars are priced at lower premiums per ounce due to lesser fabrication costs. New investors often will purchase 1 oz silver bars to start with an affordable amount and to learn how the process works. Yet, even seasoned investors have an ample supply of these smaller bars, to take advantage of their divisibility and liquidity. Bars minted in 5 oz sizes are not as common as 1 oz bars, but are still a convenient size and price for beginning investors. There are odd sizes of bars in 2 oz, 3 oz, and additional weights, but these are not common and difficult to find, thus making them much higher in price per ounce. The most sought after silver bars are the 10 oz weights, as these silver bars are a middle ground between building up a financial portfolio with 1 oz bars and actually purchasing bars in larger quantities for a substantial investment. Often, customers who purchase larger quantities of silver bars for investment will choose the option of offsite storage. There are other programs such as silver bars purchased for an IRA, or even scheduled purchasing programs on a weekly or monthly basis. Refineries and mints throughout the world create silver bars, providing investors with a wealth of choices and selection. There are many well-known businesses, a host of private refineries and mints, and even individual entities who melt down scrap silver and create their own bars. The most popular and respected silver bars are minted by a company no longer in business—Engelhard. Silver bars can be fancily designed with elaborate artwork, or plain bars with only the weight, purity, and possibly a company logo. If not collecting silver bars for their beauty, buying silver bars at the spot price or a small premium above, is the most economical way to invest. Credit Suisse Silver Bars - Large gold bullion producer who makes a small selection of high-premium silver bars. Engelhard Silver Bars - One of the most highly reputed silver bar producers, despite no longer actively producing. Heraeus Silver Bars - Very high premium silver bars, rarely available on the retail market. Johnson Matthey Silver Bars - Similar stature to Engelhard, makes popular 1 and 100 oz bars. 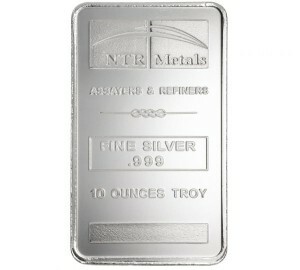 NTR Metals Silver Bars - A refiner out of Texas, producing 10 oz and 100 oz bars for cheap. OPM Silver Bars - Ohio Precious Metals, now owned by NTR and producing similar products. PAMP Suisse Silver Bars - A Swiss brand that makes high-premium art silver bars. RCM Silver Bars - The Royal Canadian Mint, produces .9999 100 oz silver bars. Scottsdale Silver Bars - A silver bar retailer who offers their own line of minted silver bars. SilverTowne Silver Bars - Another retail company that also does wholesale, offers 1 oz, 5 oz, 10 oz, and 100 oz bars. Sunshine Silver Bars - The producer of US Mint Silver Eagle blanks, makes 1, 10, and 100 oz bars. Above we have dedicated pages for each of the major brands of silver bar producers, so feel free to click them to learn more.